Just wanted to let you know we lost our wonderful Andy (originally Sandy) a few weeks ago. He came to live with us on Father's Day 2002 and we loved being his forever family. 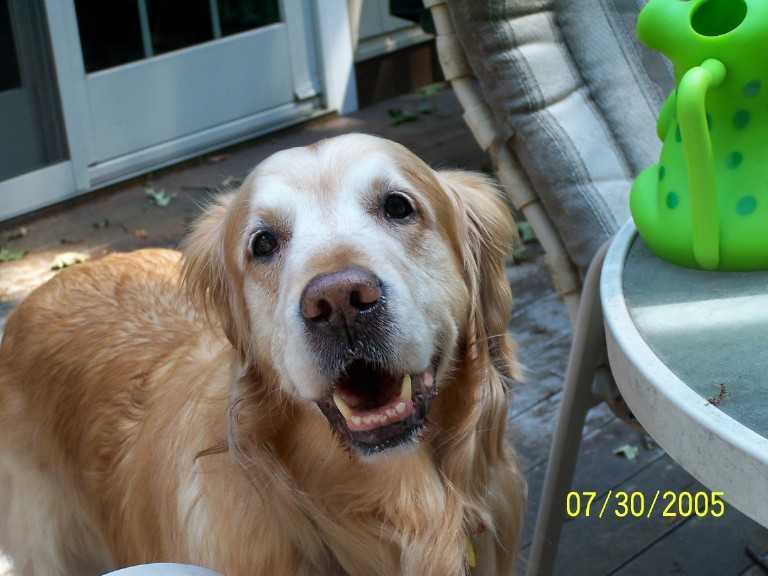 I think of what he looked like at 104 pounds and the handsome dog he became settling in at 75. 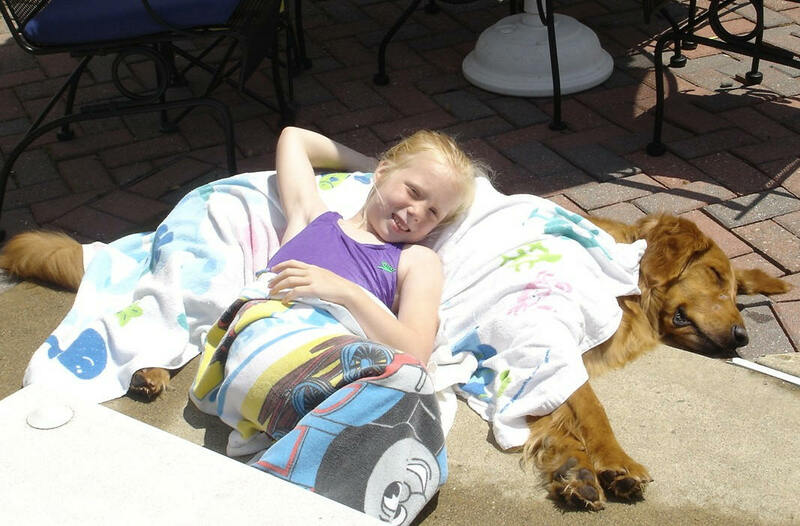 His three short years were filled with walks and swimming and children and visits as a therapy dog. Not a mean bone in his body. He was loved by all. We have an application on file as we were going to get another dog to keep him company. Please let us know when a dog comes along that fits our requirements. Dear Anita & Rick ... our condolences on your loss. And thank you for giving Andy a wonderful three years. We are having a lot of fun with Culver. He and Shadow play and sleep, play and sleep. Of course we play with him also. He is especially funny in his "kiddie pool". Everybody falls in love with him as soon as they meet him. He is such a joy and we are so lucky he is part of our family. 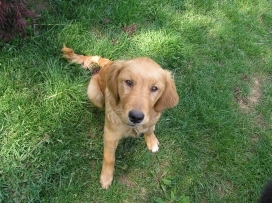 Dear Kevin & Wendy ... we love hearing how well Culver and the other Dolly pups are doing. Thanks for keeping us posted. Enclosed please find a donation. It is in memory of Homer. We got Homer from you. We miss him very much. I now have to clean up my floor when I drop something. My walking vacuum cleaner is no longer at my feet. Thank you for the 5 years of joy we had with him. Dear Susan ... we're so sorry to hear about Homer. Thank you for loving him so well those five years. Molson is doing great ! He just had a full check up and blood work. Thought you would like a picture. Dear Mark, Chris, Brooke & Amanda ... Molson looks terrific! Thanks for the photo. Kelly is having a blast. This weekend she must have been in Heaven. First, she went with us to baseball. Then I walked her to the groomer while the kids were playing, and she had a full service. She looks amazing! Then we had a mini reunion with one of my uncles, some cousins and some of the grandchildren...a small gathering at my mom's in Short Hills of just around 30 people. Kelly was in her glory. My nephews were fighting over walking her. She chased lots of groundhogs, which made my mom very happy. Then she was tired she could barely walk. Sunday she stayed at my mom's for a while when we went to church, and then my brother Tony took her to South Mt. for a little hike. In the afternoon, she went to NJ Pets to get crickets for the lizards. So she is just having a grand time. Dear Sarah ... sounds like Kelly's days are filled with fun!! Just wanted to tell you that Kailey is doing great, she just turned 1 year old and has fully adjusted to our home. She enjoys long walks with my fianc� and I and taking car rides all over the place. 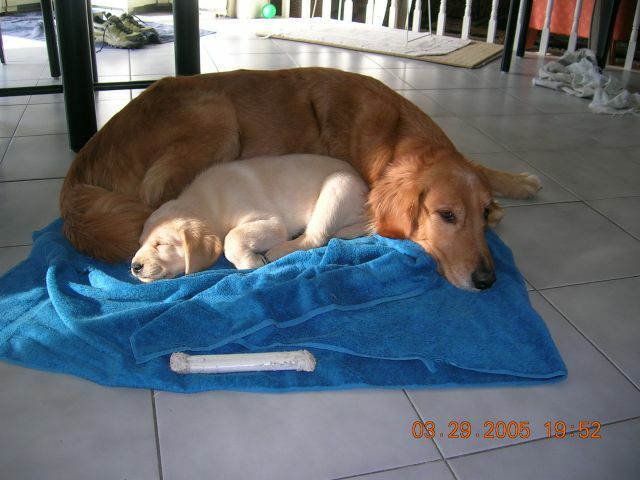 She has made friends with Jezzabel the 3-year-old Golden Retriever who lives up the block from us. Yesterday, Jezzie had Kailey over for a play date and I thought I would share a picture with you. Kailey had a blast, it was her first time in the pool and once we got her in we had a very hard time keeping her out. 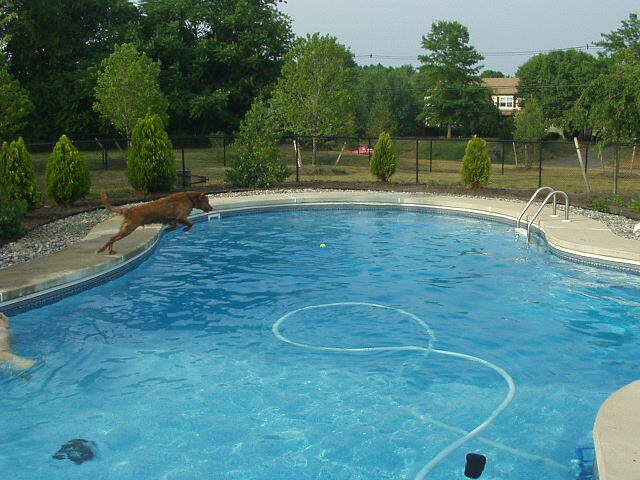 Her friend Jezzie swims for hours on end and even will submerge to pick up her favorite toy. It is so much fun to watch! Thank you again for your great services and we look forward to seeing you in September at the reunion. Dear Cliff ... that pool looks mighty refreshing. Kailey hit the jackpot! From the bottom of our hearts we thank you for your dedication to GRRI. Because of people like you and Linda, we have our beautiful little Jack. He is, to us, more precious than gold. We love him. He has brought joy back to our home, Eileen, and we will be forever grateful to you. Dear Laura ... we LOVE the drawing! Thank you! Sorry I won't brag often but I just have to tell you. Yesterday was Parker's gotcha day. I can't believe I have had him for two years. He is just the best dog. And I know my friends at GRRI set me up. He came into our lives when we were not quite sure we were ready, but he is just the best thing to come our way. I just wanted to say Thank You. Memorial Day, Parker and I went to the local Tabernacle Parade. A photographer from the local paper was there and came up to me and asked what my dog's name was. Yesterday on his Gotcha Day I got a call from him. I am a personal friend of the editor and she arranged for me to have copies made of the pictures that were in the paper. Dear Ruth ... its OK to brag about a dog like Parker! We LOVE brags like this! Attached please find photos of Daisy taken a few days after we got our second Seeing Eye puppy, Lilly. I cannot believe that this coming August will be 5 years since we adopted Daisy from you! 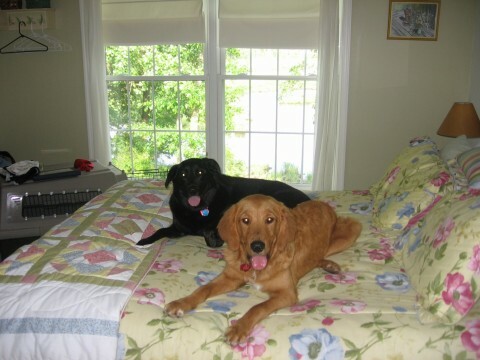 She is a wonderful, loving & energetic 6 1/2 year old and has been a great "mom" to Nate, our first Seeing Eye pup (who, by the way, is a successful dog guide, providing eyes to a wonderful man in NJ), and to Lilly. Thank you for all you do for our precious Goldens. I so enjoy reading the newsletter. Dear Peggy ... awww! What a sweet sweet photo! Ginger is doing great!!! She (and her human family -- someone had to drive) just got back from a week at the shore, where she enjoyed chasing tennis balls and going for dips in the pool every day ... she is a true joy and a real member of the family, having commandeered all the beds and couches in the house. A sweeter, more loving dog does not exist! There has been one challenge, though (well, besides the relentless counter surfing for food!) and that's that Ginger suffers from seizures ... after a year and a half of occasional seizures, she started having them in clusters ... she's now on medication and hasn't had one in 6 weeks or so. We're considering adopting another dog and would love to talk to you guys at GRRI about it. Dear Linda ... sounds like Ginger is a delight. We're so sorry to hear about the seizures ... hopefully the medications will keep them in check. 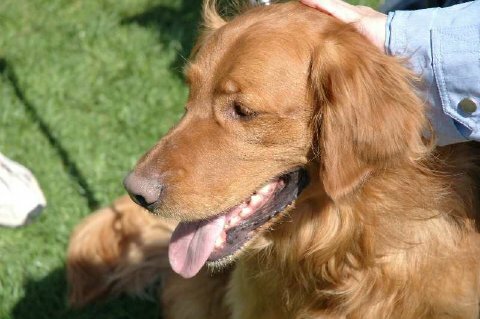 If you're looking for an all around excellent website on the topic, try The Canine Epilepsy Network. Just wanted to let you know Jake is doing fine. He is really a handful. He loves to chew stuff, but he is getting better at what he takes. He is now starting to leave the shoes alone...finally. He loved my fish book, well the cover anyway. I have attached a couple of pictures for you. I am also forwarding this email...for the pictures...to the GRRI-NJ so they can print a success story in the newsletter. Charlie is doing well also. They play all the time. We feel that we will need a little help with the training for Jake. Do you have any suggestions for people we can contact to help us with this? He has VERY selective hearing, if you know what I mean. It is also very tough to work with him with Charlie around. Anyway, any suggestions would be welcome. Dear Jeff, Julie, Charlie & Jake ... ah, training ... we all need it! Here are some websites that might be helpful: Association of Pet Dog Trainers, National Association of Dog Obedience Instructors, Inc.
We cannot begin to thank you all for your incredible help with our adoption of Riley (formerly known as Sam). 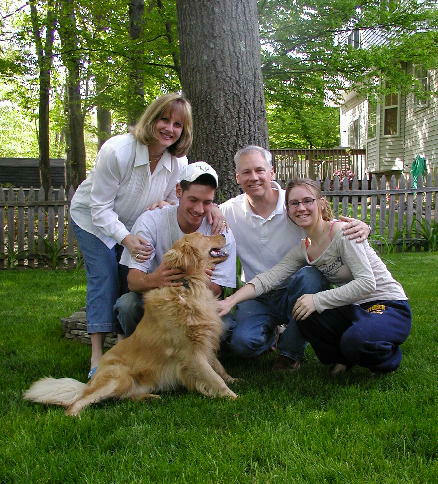 Adopting through GRRI-NJ has been one of our most rewarding experiences. Riley is a true ambassador for rescue - everywhere he goes he is lavished with attention, and we get to tell about how terrific rescue groups like GRRI-NJ and its volunteers are, and how important! 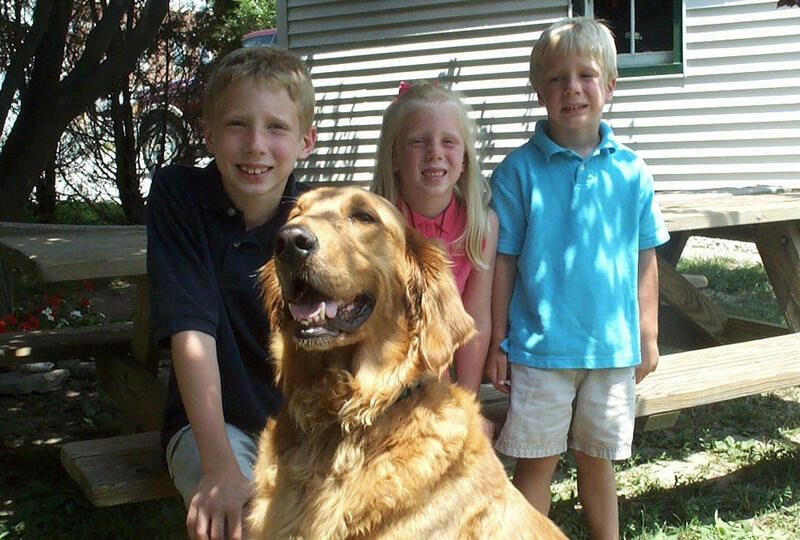 We've had more than one Golden owner tell us how wonderful he is, even for a Golden. I think some might even be a bit envious...how lucky we are to call this big, sweet, red boy our own. It's hard to believe it's been only four weeks since Riley came into our lives; it seems as if he's always been here. I can't even describe any "transition"; he came and was instantly home. We will always be grateful to his former owner for allowing us to continue to provide Riley with the love and attention he'd been used to. His life is full and very active, and in addition to his "ambassadorship", both for the breed and for rescue, he has become the unofficial mascot for Christopher and Jordan's soccer teams, and has earned the adoration of another 20-plus children on their teams. His patience is extraordinary - he can usually be found as Jordan's pillow when watching television, lounging by the pool, or just cuddling. Riley has been our constant companion wherever we go: to the park, the soccer fields, friends' homes...he has made a few new canine friends as well, and loves to have his friends over for a friendly game of tug-of-war with one of Jeff's fleece golf club covers (with Jeff's permission, of course!). Riley is as good as gold - red gold, that is! Thank you again for matching us with what I can only say is the perfect Golden. We look forward to working with you as volunteers ourselves, and meeting others who think that their Golden is the best - we sure do! 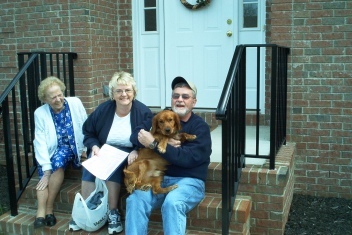 Dear Kendra, Jeff, Christopher, Jorden & Nicholas ... we're so happy that Riley has found such a loving home with all of you! I know they have been a long time coming but� here are a few photos of Miss Gracie. They are very recent � we took them this morning. Needless to say, please pass them along to the families who adopted her siblings. I�m sure they will enjoy them and see the family resemblance. She is doing quite well in her obedience training. I wish our boys were as well behaved as Gracie. Dear Ted ... yet another adorable Dolly pup! All the best with Gracie ... glad to hear she's so well behaved! This little Golden in absolutely wonderful. We've only had him for 4 weeks and it feels like we've had him forever. He truly is a joy and we all love him so much. We love the similarities to Murphy and are enjoying his very own uniqueness. He's very...I stress...very well behaved. He jumps into our king size bed each night for maybe 20 minutes or so then heads back downstairs where he's not far from the smells of the kitchen! He loves to lay in our hallway at night and shifts from doorway to doorway throughout the night hours. I could go on and on about him....like all proud mothers do, but I better get back upstairs and work on that kitchen!...ugh!...lots of dishes for Jack to lick and then into the dishwasher! !...He's a riot....he's got that head in that dishwasher, with everything, of course dripping onto his beautiful Golden noggin..!! !...so typically Golden. He's a dream. P.S. by the way....have you seen my sandals??? ?....oh that's right....ask Jack.... Seriously Eileen, I have a pair of pink sandals that haven't seen each other in two weeks....one is always somewhere else!! !.....good thing it's summer....barefoot is very fashionable during these months)!! Dear Laura ... sandals? What sandals? Carrying one shoe someplace else seems to be a Golden specialty! We think of you often. You were sort of our "mentor" during those first few difficult weeks. Tazo is the best puppy. I raised Sanibel from 7 weeks and there really is a difference between them as we go through the various puppy stages. Don't know if it is the Golden breed or because he had Sanibel to mentor him. He was potty trained and knew all his commands at a very early age. He is the most mellow dog. People always comment on what a calm puppy he is. So calm and loving! 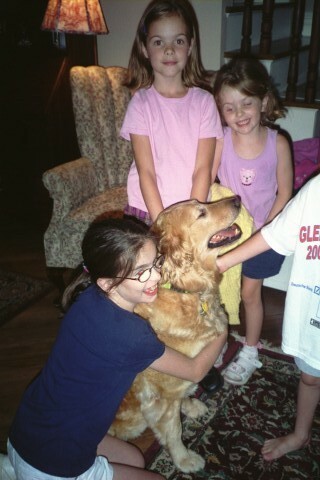 We just love him to death. He and Sanibel are inseparable. You will smile when I say this....I cannot imagine my life without the both of them together! They eat, sleep, play and potty together. Sanibel has never been one to cuddle but Tazxo will just lay on her body and kiss her to death and she loves it. And the bitey-face thing is so cute! He is well socialized with kids, other dogs, the birds in our yard. He loves our cats too. He also loves to watch the airplanes fly over our house and we have caught him watching TV! We will forward pictures. He is our handsome boy. Thanks so much again and again for giving us our little miracle! Dear Kelly ... Tazo looks comfy and happy! Just what we LOVE to see! Thanks for the info. Culver is doing great! He and Shadow are playing a LOT outside since the fence was finished. A few pictures are attached. The picture of Culver by himself is called 'Who? Me?' because he had just pulled a branch and shredded a bunch of leaves off of my beautiful japanese maple tree. But, how can anyone stay mad at such a face! 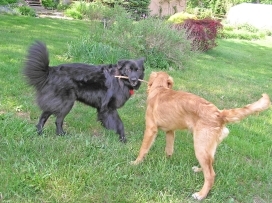 Shadow and Culver have many toys, however, as you can see in the other two pictures, they just love a good stick. I'll look for the letter from Eileen and let you know how it goes. Dear Wendy ... Culver looks like an adorable little devil ... having the time of his life! These Dolly pups are really something special! Mr. 'Bailey' did very well with his surgery and loved Delaware! We had beautiful weather and we walked (mostly Ted) two and three times a day. When we were at our house, we sat out on the deck and Bailey had a 20 foot lead so that he could enjoy the deck with us and a little more freedom. We bought a 'soft kennel' for Delaware, but Bailey 'rolled' from the bedroom into the living room inside of it, so he just came with us everywhere we went. He even met two of his 'cousins'.....a chocolate lab named 'Bailey' and a 13 year old hound named Clara. 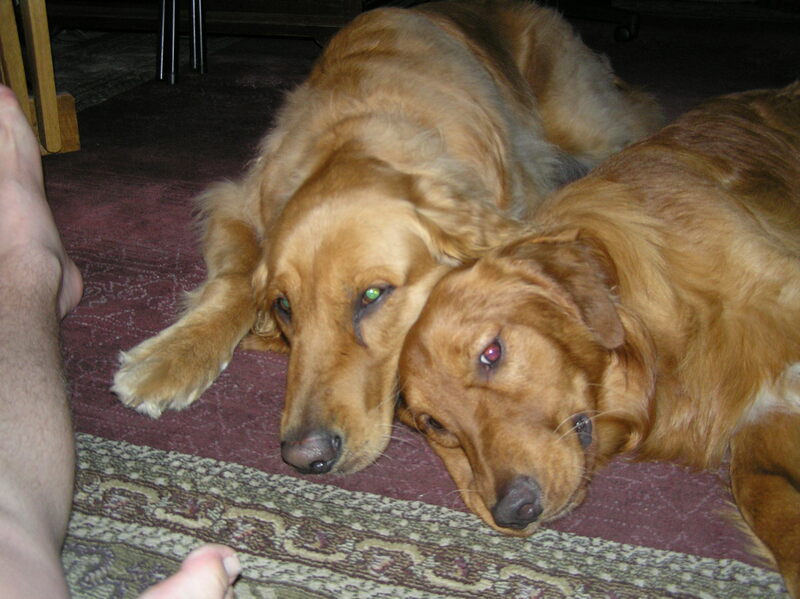 Bailey and Bailey had a great time together and our Bailey never let up or backed down. The day after both Baileys were exhausted. This summer our time will be spent both in NJ and Del...Bailey enjoyed the ride down as well and wasn't a problem at all. We also are officially a 'family' now having sent the 'fee' to Eileen and also the microchipping paper work. There's a lot more laughter in our house now that we have Bailey. He brings us lots of enjoyment. Sure ... he is a little mischievous, but that is to be expected. 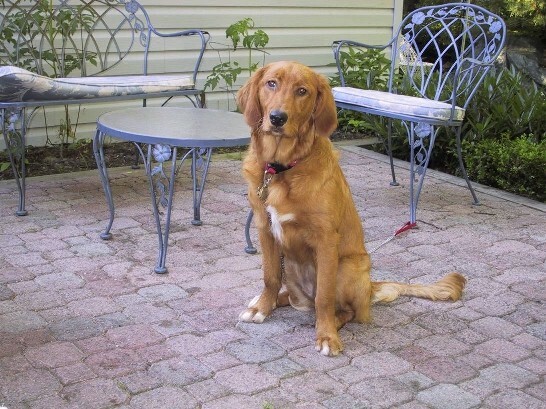 For example, Ted and I were having breakfast one morning at our kitchen table and suddenly there was Bailey sitting on the table --he had jumped from a sitting position up onto the table. It took us so by surprise that we were really dumbfounded.....so I simply picked him up and put him back on the floor. And we've been laughing about it ever since. We do have a kennel here for when no one is home which he goes into with little problem. But at night he sleeps in our bedroom and often in our bed at the foot of the bed. He is on heartworm preventative and Frontline for ticks, etc. We have pulled at least 3 ticks off of him ( I think due to the weather), but we also have some stuff sprayed on the lawn to keep ticks in control. We are thrilled to have him. We still are talking about getting another dog. Dear Laura & Ted ... looks like Bailey has wormed his way into your hearts for sure! Dear Patricia ... awww, what a face! Extra cookies and pets from all of us! Hope all is well. We just wanted to let you know Kip will be celebrating his 7th birthday in just a few hours on Aug 17. We are certainly having a party for him but we already gave him his presents today. When we walk in the door with a bag Kip sticks his nose into it to look for his doggy toys so he found them today. He's a wonderful companion and we love and enjoy him so. He is so loyal to Joel you would think we had him all of his life, we've had him 10 months. Keep Kip in your thoughts as he turns 7. Dear Paula & Joel ... many happy birthday greetings to Kip from all of us at GRRI-NJ! 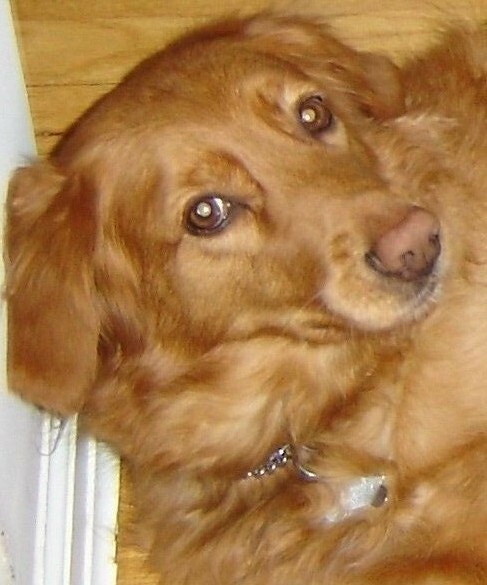 Please accept our donation to the Joann Smith Memorial Fund in memory of our precious Carli. I continue to look at her on the website and am very appreciative of your support last year during a very difficult time. We miss Carli dearly. 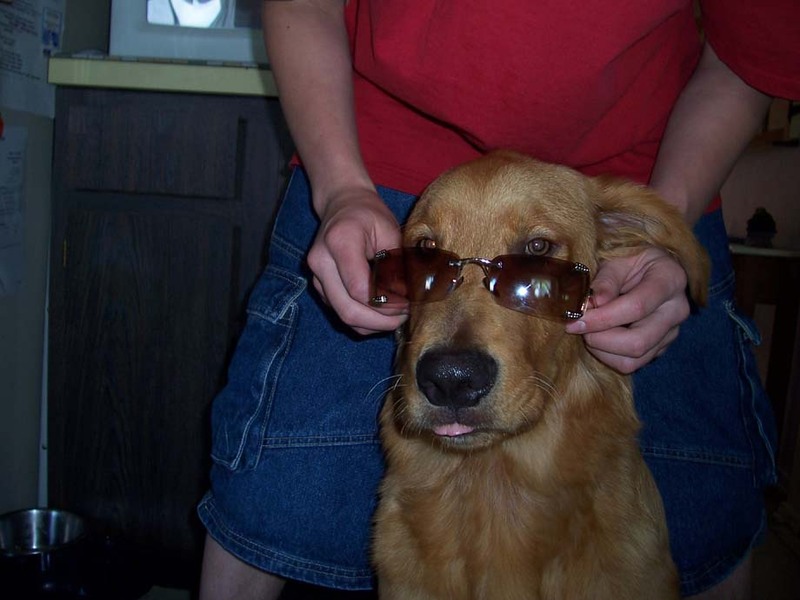 We would like to help a Golden with special needs. Liberty is doing just great and he is such a love! Full of energy, yet likes to cuddle! He has helped me. We plan to see you in September! Take care and thank you for all you do for our special breed. Dear Irene & Joe ... thank you so much for the donation. Glad to hear Liberty is doing so well! Brandy is so happy to be home again - but you already knew that. Katie and I thank you so much for coming to the rescue on her behalf. Although she wandered home on her own, you all certainly kept our spirits high and our hope alive. 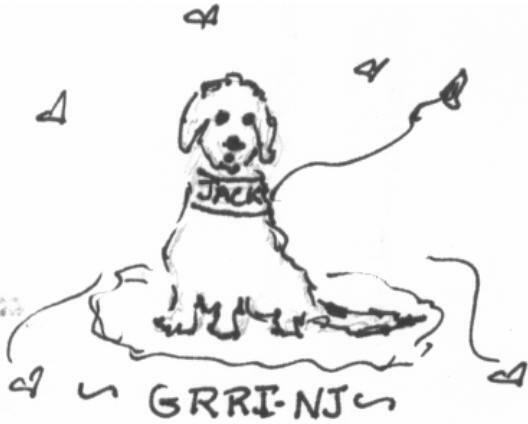 Dear Katie & Michael ... give your white faced wanderer a big hug from all of us at GRRI-NJ. And thank y you for your very generous donation!